Create beautiful curves in wood, metal, and other materials with this specialized tool and these techniques. 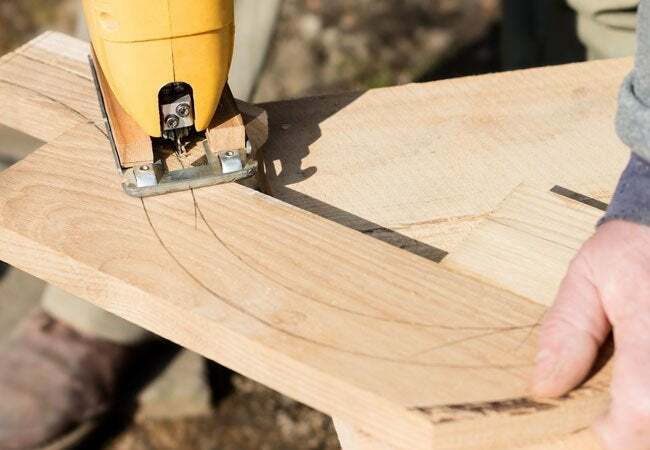 Whether doing fine woodworking or tackling a kitchen or bathroom remodel, chances are you’ll need to create some curves—and that’s where a jigsaw comes in. 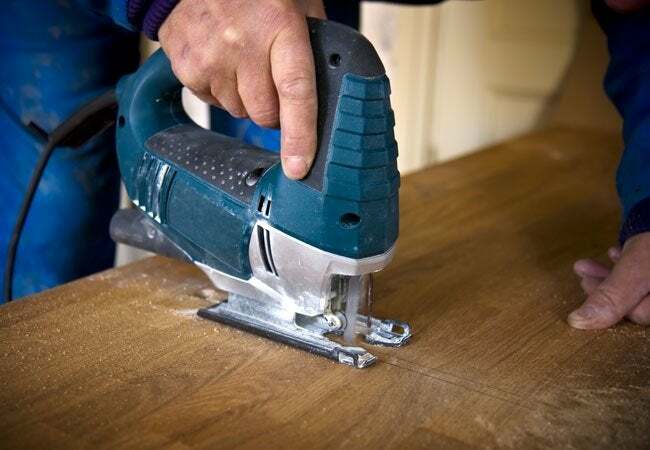 While a table saw or a circular saw won’t do the trick, the main purpose of a jigsaw is to cut curved lines into a variety of materials, including thin metal, laminate, plastic, and even ceramic tile, as well as wood (especially soft species such as pine). You can find a basic jigsaw starting at around $40 or pay up for to $200 for a heavy-duty professional model with such advanced features as orbital blade action, blade-steadying guides, and multiple speed options. If you’re only going to use the saw occasionally, you can probably get by with a less-expensive model. Once you’ve geared up, follow this guide for how to use a jigsaw safely and get great results on all types of projects. Choose the right blade for the job. The jigsaw blade package will specify the material the blade is designed to cut, saying “wood” or “metal” right on the label. The blade’s teeth-per-inch (TPI) number will also appear on the package and sometimes on the blade itself. A TPI of 10 or 12 is suitable for most woodworking projects. Lower TPIs, which mean fewer saw teeth per inch, allow you to cut faster, but the cut will be rougher. Higher TPIs cut more slowly to create smoother finishes. Another consideration is proper blade width. Select the width that suits the tightness of the curves you’ll be cutting. Jigsaw blades come in two widths, ¼” for cutting tight radius curves and 3/8” for more gradual curves. Finally, familiarize yourself with teeth direction: A standard jigsaw blade has teeth pointing upward to cut on the blade’s upstroke—it’s the best choice for all-purpose cutting. A reverse blade (teeth pointing downward) should be used on material with a pre-finished surface to reduce the risk of chipping or nicking during the cutting process. Put safety first! Don appropriate eye protection and plug in an extension cord because jigsaw cords are relatively short. Keep the extension cord away from the cutting path and don’t let it pool in the standing area where it could become a tripping hazard. Position the shoe firmly. The shoe—a flat base that extends a few inches past the front, sides, and back of the blade—must remain flat against the material you’re sawing to ensure an accurate cut. Position the front end of the shoe flat on the material you intend to cut and align the cutting guide on the front of the shoe with the line you’ve marked on the material, but don’t let the saw blade touch the material before the jigsaw is running. Hold it back just a bit, turn on the tool, and then ease the jigsaw forward to begin the cut. If the blade is touching the wood when you turn the saw on, the blade can catch on the wood, jerking the saw and breaking the blade or cutting in the wrong spot. Drill first to cut center holes. 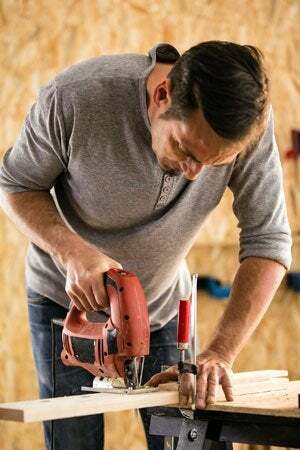 To cut a hole in the center of your material as opposed to curving the edge—such as for a sink opening in a countertop—drill a starter hole before using a jigsaw. Drill a ½-inch hole and then insert the jigsaw blade in the hole and start cutting there. Don’t turn the saw on until the blade is all the way in the hole and the shoe is resting on the material’s surface. Sandwich sheet materials in plywood. Attempting to cut sheet metal or hard plastic sheeting without reinforcement can result in ragged edges and a bent product. The best way to cut these materials is to first layer them between ¼”-thick pieces of plywood. For example, if you’re cutting large letters from sheet metal, sandwich the sheet metal between two pieces of plywood, one above and one below. Secure the layers together with clamps, and then saw carefully through all three layers. Using the sandwich method will give you the cleanest cuts on thin sheet materials. Protect finished surfaces from scratches. Laminated countertops, for example, can be scratched by the bottom of a jigsaw shoe that scrapes the surface during cutting. If your material comes with a protective film, leave it on during the cutting process. If you have to cut an unprotected material, cover the area to be cut with masking tape and draw your cutting guides on top of the tape. This will protect the surface from scratches as you cut. Adjust the angle for beveled cuts. Not all jigsaws offer this feature, but it’s handy if you wish to create a sloped edge. Simply adjust the angle of the blade and follow the same cutting techniques as for vertical cuts. Speed up the cutting process. When activating the “oscillating” feature often found on higher-end jigsaws, the blade moves in a forward/backward rocking motion as well as up and down. Oscillating blades provide additional cutting power and speed without increasing the risk of edge burrs and splintering. Take your time when cutting tile. While pros generally use a tile saw for this task, a DIYer can use a jigsaw on tile as much as ¼-inch thick. If you’re determined to learn how to use a jigsaw on tile rather than invest in another new power tool, start by putting masking tape on either the face of the tile or on the bottom of the jigsaw shoe to prevent surface scratches. Then use a corresponding tile blade and clamp the tile securely to prevent shifting. Go slowly and let the blade do the work. Cutting tile with a jigsaw requires patience and a steady hand.